64 square feet of hamburger heaven at Wedl’s in Jefferson, along US 18 just east of Business Highway 26. Along U.S. 18 right by the city/”business” route of Highway 26, you’ll find that good things come in small packages. 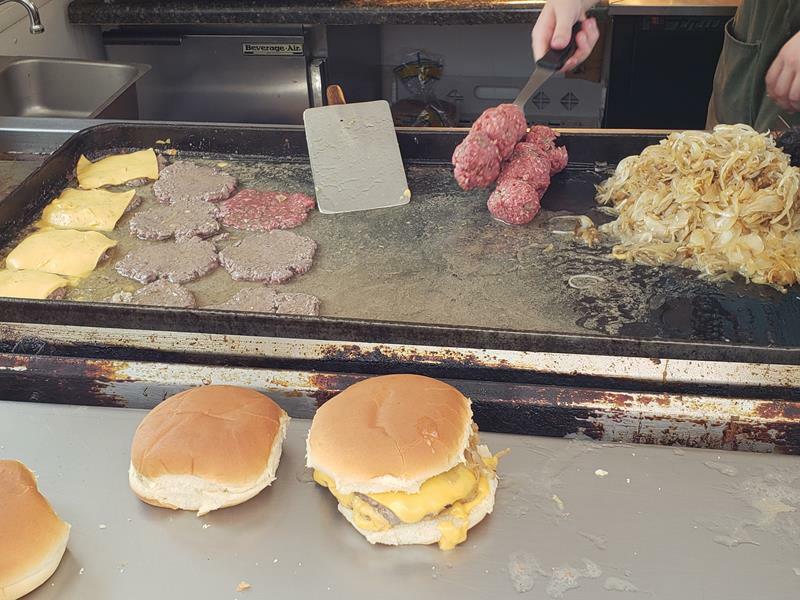 Wedl’s, perhaps one of the smallest burger stands in the nation, is ready to provide small, tasty burgers using a cast iron skillet over a century old. All from a building that measures about 64 square feet. Wedl’s Hamburger Stand & Ice Cream Parlor is a combination burger grill and ice cream shop in downtown Jefferson with roots that go back to the shop’s original opening in 1916. The outdoor stand opened three years later. Ownership has changed through the years; previous names for the Wedl’s include Becker’s (1949-1974) and Armstrong’s (1974-2002). The seasoned cast iron skillet, an original, dates back over 100 years; it was launched into the street when an 80-year-old driver plowed into the small stand in 1999. While the stand was destroyed, the two employees inside were not seriously injured. The grill was found about a half block down the street, restored, and put back into service after a rebuild. This cast iron skillet, over 100 years old, seasons and cooks the tasty little burgers at one of tastiest burger stands in the country: Wedl’s in Jefferson. Wedl’s offers their burger slider-style. The meat patties are around 1/8 pound, so a “double” is 1/4 pound. As described by Robby Wedl, manager and part owner, they start with a big mound of lard in the morning. They add the patties as orders come in, add onions and cheese when people want them, and they gradually use up all the lard. And that’s a big reason these burgers taste so good: old-fashioned lard. It’s not the lightest way you can cook up a burger, but there’s no doubt it’s natural and delicious. And a little greasy sometimes. Cheese, bacon, and either raw or fried onions are your choices for toppings when Wedl’s serves you; no lettuce or tomatoes. They do offer condiments and pickles you can add yourself, though, on the metal tray in front of the pick-up window. 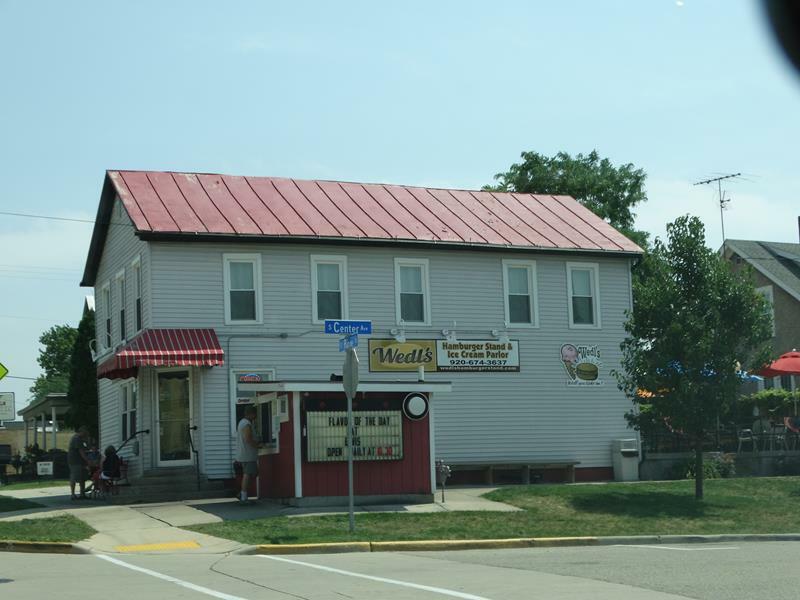 You can also get pizza burgers and – from the other kitchen inside – fish or chicken sandwhiches, hot dogs, brat, and the like. Sides range from onion rings and fries to jalapeno poppers and nachos. See their full menu here. 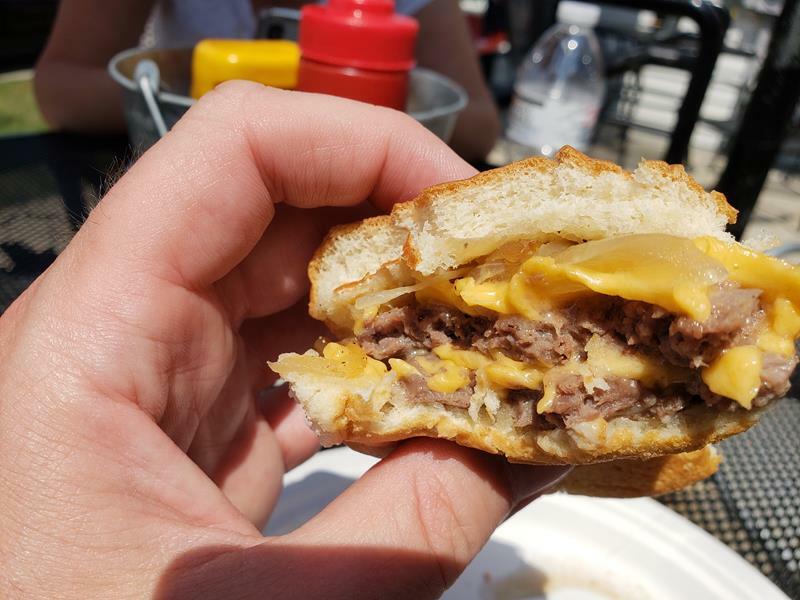 Part-way through a double cheeseburger. They’re so good, you almost forget to take a picture. Wedl’s is popular for carry-out orders. You can also eat inside the parlor or on the patio deck in the back on good weather days. 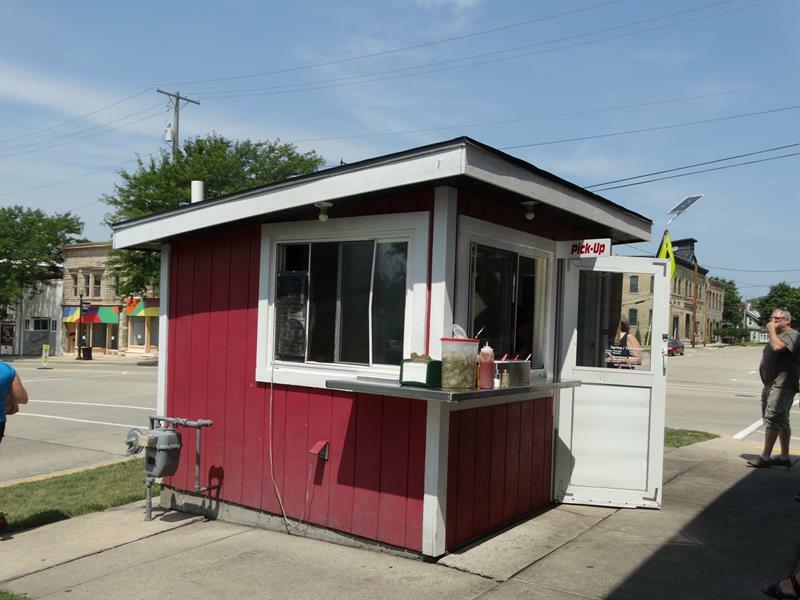 You’ll find the stand right along U.S. 18/Racine Street, one block east of “Business” Highway 26 in downtown Jefferson. It’s also about a mile east of Highway 89 and the newer Highway 26 bypass. Either way, it’s definitely worth the stop!